Actinic Keratosis: A rough red scaly patch that results from chronic sun damage (also known as ‘Solar Keratosis’). 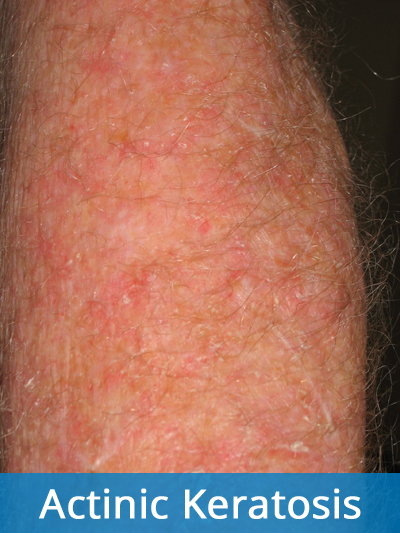 Without treatment, these lesions may eventually develop into Squamous Cell Carcinoma. Thus, they are sometimes referred to as a “pre-cancer” or a “pre-cancerous lesion”. Treatment is recommended for Solar Keratosis. Angioma: A red spot that is composed of dilated blood vessels. These lesions are benign and no medical treatment is necessary. However, we can remove them for you at DSI if you have cosmetic concerns. Cysts: A benign skin colored bump often located on the scalp or trunk. These lesions are typically filled with keratin, arise from follicular components, and often have a sinus tract. The two most common types of cysts are known as Sebaceous Cysts and Trichilemmal Cysts. Cysts are typically asymptomatic but can be irritating or become infected. If you think you have a cyst and would like it removed, schedule an appointment with DSI today. Lentigo: A brown spot on sun exposed areas, often on the face, upper back, extremities, or hands. These lesions are benign and no treatment is needed but they must be differentiated from skin cancer. A solar lentigo can be treated for aesthetic concerns. Lipoma: A skin colored bump that is composed of abnormal collection of fat cells that develops just below the skin. They are often on the trunk but can form anywhere. These lesions are benign and can be removed at DSI. Moles (nevi): Moles are usually brown spots or bumps often with hair growing within them. These lesions may be present at birth but they could develop through adulthood. The medical term for a mole is a nevus. A nevus rarely changes so if your mole is getting bigger, darker, or growing you should have a skin exam to rule out skin cancer. Sometimes removal is medically necessary. However, if the lesion is truly a nevus, then it is benign and no further treatment is necessary. However, a nevus can still be removed for cosmetic concerns. 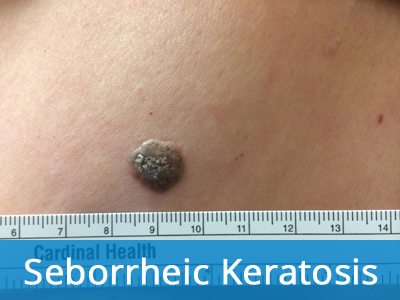 Seborrheic Keratosis: These lesions are usually brown spots or growths that have a waxy stuck-on appearance. Many people try to pick these lesions off but they usually grow back. They may be induced by sunshine but have an inherited component. Seborrheic Keratoses are very rare in young people and typically start appearing as a middle-aged adult. If they cause no problem then no treatment is needed. However, they may become itchy and irritated necessitating treatment. In other cases, they are located on the face or may be unsightly. At DSI, we can remove them for you if needed, see our lesion removal section. 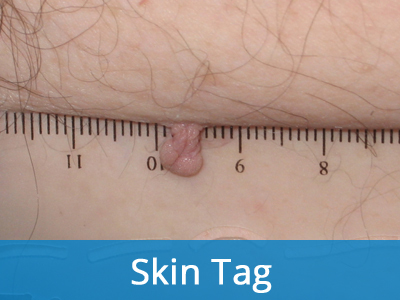 Skin Tags: Skin tags are fleshy growths that often appear around areas of friction. Skin tags most commonly occur on the armpits, groin, neck, and eyelids. These lesions are benign and no treatment is medically necessary. At DSI, we can remove them for you if you have cosmetic concerns, see our lesion removal section. Warts: A wart is a skin manifestation of a viral infection from the Human Papilloma Virus. These lesions usually are skin colored and have small finger-like projections on the surface when you look closely. They are contagious and should be treated or removed. © Dermatology Surgery Institute 2016. All rights reserved.